For the asteroid, see 2674 Pandarus. For the sponge genus, see Pandaros (sponge). Pandarus, centre, with Cressida, illustration to Troilus and Cressida by Thomas Kirk. Pandarus /ˈpændərəs/ or Pandar /ˈpændər/ (Ancient Greek: Πάνδαρος Pándaros) is a Trojan aristocrat who appears in stories about the Trojan War. In Homer's Iliad he is portrayed as an energetic and powerful warrior, but in medieval literature he becomes a witty and licentious figure who facilitates the affair between Troilus and Cressida. 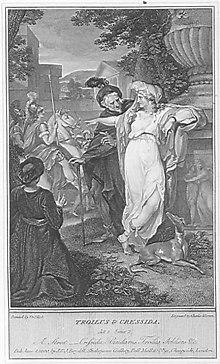 In Shakespeare's play Troilus and Cressida, he is portrayed as an aged degenerate and coward who ends the play by telling the audience he will bequeath them his "diseases". In Homer's Iliad, Pandarus is a renowned archer and the son of Lycaon. Pandarus, who fought on the side of Troy in the Trojan War and led a contingent from Zeleia, first appeared in Book Two of the Iliad. In Book Four, he is tricked by Athena, who wishes for the destruction of Troy, to shoot and wound Menelaus with an arrow, sabotaging a truce that could potentially have led to the peaceful return of Helen of Troy. He then attempts to kill Diomedes at close range, since Athena is protecting him from his deadly arrows, while Aeneas acts as his charioteer. Diomedes narrowly survives the attack, though, retaliating with a deadly blow that knocks Pandarus out of the chariot. Diomedes then pursues Aeneas, who is saved by his mother Aphrodite. Pandarus is also the name of a companion of Aeneas in Virgil's Aeneid. Pandarus is not to be confused with Pandareus. Pandarus appears in Il Filostrato by Giovanni Boccaccio, in which he plays the role of a go-between in the relationship of his cousin Criseyde and the Trojan prince Troilus, the younger brother of Paris and Hector. Boccaccio himself derived the story from Le Roman De Troie, by 12th-century poet Benoît de Sainte-Maure. This story is not part of classical Greek mythology. Both Pandarus and other characters in the medieval narrative who carry names from the Iliad are quite different from Homer's characters of the same name. In Geoffrey Chaucer’s poem Troilus and Criseyde (1370), Pandarus plays the same role; though Chaucer's Pandarus is Criseyde's uncle, not her cousin. Chaucer's Pandarus is of special interest because he is constructed as an expert rhetorician, who uses dozens of proverbs and proverbial sayings to bring the lovers Troilus and Criseyde together. When his linguistic fireworks fail at the end of the story, the proverb and human rhetoric in general are questioned as reliable means of communication. William Shakespeare used the medieval story again in his play Troilus and Cressida (1609). Shakespeare's Pandarus is more of a bawd than Chaucer's, and he is a lecherous and degenerate individual. In The Duke's Children by Anthony Trollope when the Duke of Omnium suspects Mrs Finn of encouraging his daughter's romance he refers to her as a 'she-Pandarus'. In "The Sailor Who Fell From Grace With The Sea" by Yukio Mishima, Pandarus is mentioned briefly during an internal contemplation by the character Ryuji Tsukazaki. The plot function of the aging lech Pandarus in Chaucer's and Shakespeare's famous works has given rise to the English terms a pander (in later usage a panderer), from Chaucer, meaning a person who furthers other people's illicit sexual amours; and to pander, from Shakespeare, as a verb denoting the same activity. A panderer is, specifically, a bawd — a male who arranges access to female sexual favors, the manager of prostitutes. Thus, in law, the charge of pandering is an accusation that an individual has sold the sexual services of another. The verb "to pander" is also used in a more general sense to suggest active or implicit encouragement of someone's weaknesses. ^ a b "Pandarus in Troilus and Cressida". www.shmoop.com. Retrieved 12 December 2018. ^ "Troilus and Cressida. Act V. Scene X. William Shakespeare. 1914. The Oxford Shakespeare". www.bartleby.com. Retrieved 12 December 2018. ^ Belknap, Jacob. "Pandarus in The Iliad: Character Analysis". Study.com. Retrieved 12 December 2018. ^ Kline, A. S. (2009). "Homer (c.750 BC): The Iliad Book V". www.poetryintranslation.com. Retrieved 12 December 2018. ^ Nehrkorn, Helga (October 1971). "A Homeric Episode in Vergil's Aeneid". The American Journal of Philology. 92 (4): 566–584. doi:10.2307/292664. JSTOR 292664. ^ "Il Filostrato Critical Essays". eNotes. Retrieved 12 December 2018. ^ a b Crane, Samantha. "The Pandering of Pandarus". www.mckendree.edu. McKendree University. Retrieved 12 December 2018. ^ Richard Utz, "Sic et Non: Zu Funktion und Epistemologie des Sprichwortes bei Geoffrey Chaucer,” Das Mittelalter: Perspektiven mediävistischer Forschung 2.2 (1997), 31-43. ^ "Pandarus". www.playshakespeare.com. Retrieved 12 December 2018. ^ Trollope, Anthony (2011). The Duke's Children. OUP Oxford. pp. 40, 522. ISBN 9780199578382. ^ The Sailor Who Fell From Grace With The Sea. archive.org. 1963. Retrieved 12 December 2018.